Who doesn't love the Solar System! Space fascinates children from the primary grades through adulthood. Here are some projects I made for the classroom or home! I love the tree charts--I think it is a great way for pre-writing! If you want a copy of our sun and its planets, click here. One of my favorite discussion activities is a K-W-L Chart. They help to activate children's prior knowledge, and it lends itself to a wonderful way of closing the lesson. 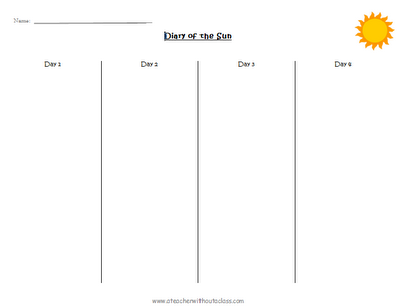 I made the charts for the sun and its planets. Find it here. I love the whimsy of making inanimate objects real. The students can write diaries for the planets. It could even be a class project and made into a class book. This is a graphic organizer for the pre-writing stage. You can find the entire solar system here. 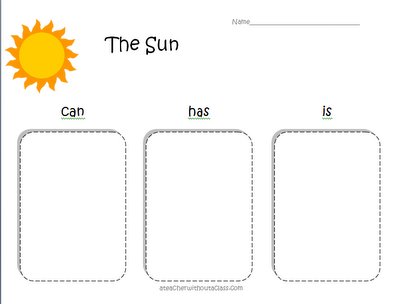 I love making these graphic organizers for two reasons: they are easy and students love them! I take two sheets of 12"x18" construction paper and line them up so there is about an inch between. I fold it over and staple, and I have a very cool graphic organizer. I have used it for planets, life cycles of butterflies and frogs, the layers of a tropical rain forest, and the layers of the seas. It works well for anything! You can see what it looks like on the inside. I drew each of the rock planets and wrote facts for each planet. I was trying to think of a fun way to make the planets. As you see they are not to scale! Mercury: I took orange paper, white paint and marbles. I think it looks cool! Venus: blue paper and white paint and marbles. I wish I made clouds on the blue paper instead. Earth: white paper, green and blue paint, marbles. I have made better, but it is still fun to roll those marble around. Mars: red paper with sponged orange paint. I was trying to make the cool orange rocks of Mars. 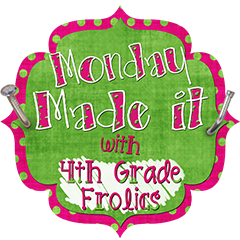 There are many other great ideas at 4th Grade Frolics! You are very generous to share all your work with others! thank you! I love the graphic organizer idea! Thank you for sharing!! I LOVE these! 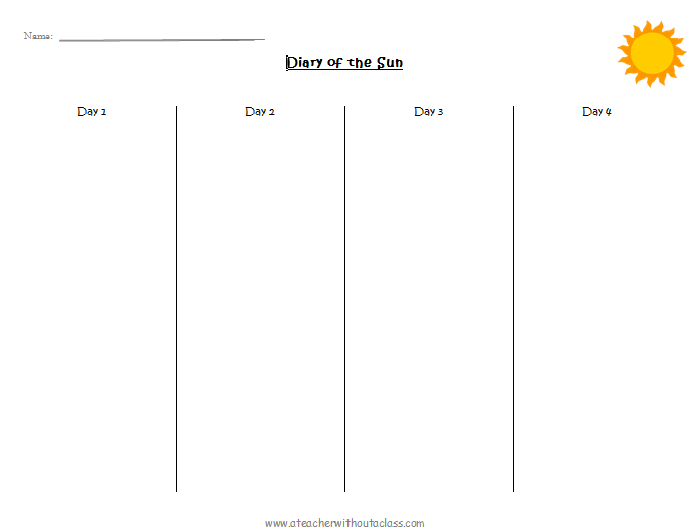 I'm experimenting with interactive notebooks next year in science and these graphic organizers will be a GREAT help when I teach my solar system unit!